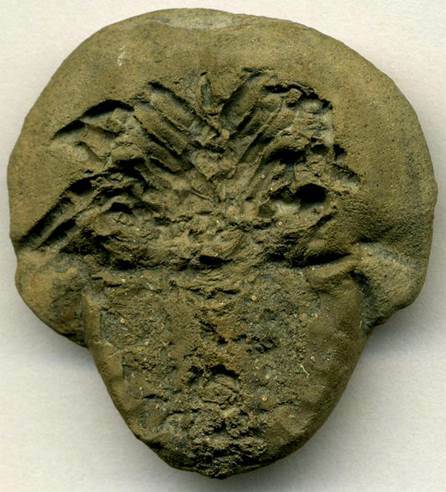 Horseshoe crab fossils are relatively uncommon in the rock record. The fossil shown below lacks the telson, but does have appendages preserved. This is Paleolimulus signatus (Beecher, 1904) (Arthropoda, Chelicerata, Xiphosura), from the Pony Creek Shale Lagerstätte of eastern Kansas. Stratigraphy: Pony Creek Shale Member, Wood Siding Formation, Wabaunsee Group, Virgilian, upper Upper Pennsylvanian. Locality: roadcut on southern side of Interstate-70, ~1 km west of overpass at Maple Hill exit, Wabaunsee County, eastern Kansas, USA. Paleolimulus signatus (Beecher, 1904) fossil horseshoe crab (31.5 mm tall) from the Wood Siding Formation (Upper Pennsylvanian) of Wabaunsee County, eastern Kansas, USA.